Founding director and past president of the Rossmoor Fund, David Smith was a member of the Board of Directors of the Golden Rain Foundation, the governing body of Rossmoor in Walnut Creek, California from 2005 – 2011 and served as its president for three of those years. While living in Rossmoor, he was the chairman of the Golden Rain Foundation Finance Committee, was also a member of the Board of Directors of Hospice of the East Bay. 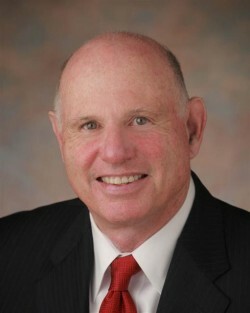 Mr. Smith is a retired attorney from one of the largest law firms in Contra Costa County, a firm which he founded. He is a graduate of Colgate University and Columbia University Law School. Mr. Smith is a past director of seven community banks in Alameda and Contra Costa County, California, and a public bank holding company. An active member of his community, Mr. Smith formed the San Ramon Chamber of Commerce, is a past president of that Chamber, and served as a director of that Chamber during its formative years. He was instrumental in building the San Ramon Library, is a past president of the San Ramon Library Foundation, and served as a member of the board of directors of that foundation. He is also a past member of the board of directors of the Eugene O’Neill Foundation – Tao House, and is a charter member of the San Ramon Rotary Club.